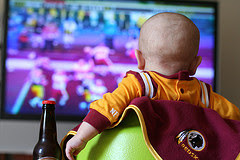 The youngest dedicated Redskins fan. and if the real blogger starts blogging then we might get a few more pictures. But I just had to post this one. I understand that they are going to withhold grandma time until the blogger starts writing...well, if that works, but if the blogger doesn't want to blog....so be it. Foosball is a real man's game.